Activists of a non-governmental organization propagating patriotism across the country have reached Shillong, the capital city of Meghalaya on Thursday. ‘Swabhimaan desh ka’, as the non-governmental organization is called is aimed to instil a spirit of patriotism among the youth across the country. The team, led by Surender Singh Bidhuri, is undertaking a three months long march christened ‘Shaheed Swabhimaan Yatra’ which will cover all the 29 states across the country. The march of this patriotic NOG has already covered 15 states out of the 29 covering a distance of over 13,500 km. They had travelled for 56 days till now. The NGO is also collecting soil from all states of India in their journey. 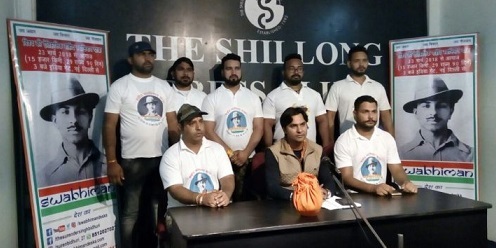 Interacting with media persons at the Shillong Press Club in Shillong, the team leader Bidhuri said the march began on March 23. He further said that their country-wide march is aimed with a purpose – to give respect to all the martyrs of the country. They also demanded that the government attributes Bhagat Singh the title of ‘Son of the nation’. The NGO also plans to put up a 100 feet tall statue of martyr Bhagat Singh along the Delhi-Punjab road for which soils from all the states have been collected to be scattered all around the statue.